Hi – if you’re reading this then you’re probably interested in hosting an RA2 tournament here on GTM. That’s great, because we want to encourage everyone to be active members of the community and to advance their skills. This thread will outline all the steps you need to take and will hopefully give you all the help you need to pull off a tournament without any major hitches. 17/01/2014 - Update - This is now updated to follow the new system. The Golden Rules of the Tournament Section are simple. Stick to them and you’ll do fine. 1) Don’t start a tournament if you can’t host it or won’t have time to complete it. 2) If you don’t have a general idea, don’t start a tournament. Instead, make use of the General Tournament Discussion Thread, mull your ideas over with other forum members, develop them, and once you have your firm idea, then make your thread. 3) If you cannot AI, do not start a thread until you have found someone who is willing to AI for you learn how to! The best place to ask for help is the General Tournament Discussion Thread. This is the Tournament Section of GTM. I'll briefly describe each sub-forum and what happens in it. 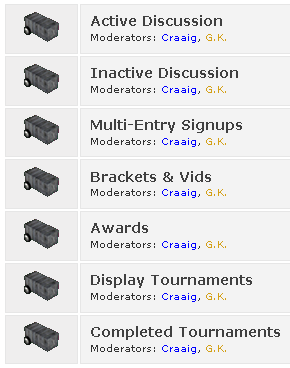 This forum is where you pitch your ideas for tournaments. Until you have completed 3 tournaments successfully, your tournaments will have to be voted for by the community before they can go ahead. More on all of this later. Ideas that have been languishing inactive in discussion for 6 months get moved to this forum, so as to not clutter the Discussion section. If you wish to revisit a tournament or take over the tournament, please feel free to do so. After your tournament is approved, the topic in ‘Discussion’ will become a signups topic and will be moved to this sub-forum. The mods will do this, so don’t worry about having to do anything at this stage. Once the thread is in this sub-forum, you can begin accepting entries until you have filled up all available spaces. Once you have all of the entries, they are AI’d and you are ready to begin, this forum is where you create a new thread, which will contain the brackets, splash and all the videos of the tournament. Again, much more on all of this later. Once your tournament is concluded, if you are handing out awards, then you create a new thread in this sub-forum where any voting or awards-related posting takes place. Display Tournaments do not fall under the usual ‘tournament’ remit. These are tournaments which you have to put on entirely by yourself. You have to provide all of the bots, videos and cannot ask for help with them. They are not counted in your tournament hosting tallies and can be run at whatever rate suits you. These tournaments can be useful for showing your abilities as a tournament host, especially if you are a newcomer to the forum, and also if you are waiting for a tournament to pass the voting stage, it gives you a platform where you can keep practising your hosting skills so that you can remain ready for when your tournament passes the vote. This sub-forum is essentially an archive of all older threads, which is kept to the others are left free of clutter. Once you start a thread in Brackets & Vids your thread in signups is moved there, and after your tournament is finished the B & V thread and Awards thread (if you make one), will end up here also. If you ever want to find anything in here, your two best options are using the search function, or clicking on the ‘Subject’ hyperlink above all the threads, which sorts them alphabetically, making finding things a lot easier. Your moderators for the main tournament sub-forum are Geice and Thrackerzod (previously yugitom, Craaig and GK). They are in charge of the section and will keep everything ticking over. They are experienced and knowledgeable members of the forum so they should be your first port of call with any questions. Feel free to PM them or ask in this thread, if you have any questions about the tournament process whatsoever. Not anyone can just click their fingers and be a good tournament host. Things don’t work like that. As such, you need to have particular skills before you consider hosting a tournament, which are listed below. 1) Commitment – Without commitment to hosting a tournament, especially if it is a larger one, you could well find yourself quitting your duty and leave people who have built a robot for your tournament disappointed. 2) Time – As a first time host you always underestimate the amount of your free time that this will take up. You have to leave enough time to get it done, because for your first 3 tournaments, you will only get a window of 4 months to complete a tournament (this starts from approval of signups). 3) Video Capture – You have to, in order to display the tournament to the people, film the battles with a video capture program. The most common ones used by GTM Hosts are OBS, Nvidia Shadowplay, FRAPS and Bandicam but these are not the only options. You will then need to be able to present the battles in video format, uploaded to the internet. You are not expected to do any fancy-effects-trickery, only to provide the raw footage, but nice presentation will take you far. GTM Tutorial Index – Contains a section with all the AI tutorials available on GTM. Philetbabe’s AI Chart – Explains very well what basic AI do and how to AI bots. Clickbeetle’s AI Essentials – Contains most of the standard AI.py’s of the current time, as well as templates for bindings.py which can save you a huge amount of time. Apanx’s Bot Exporter – Really useful tool for checking weapon numbers when writing bindings. The AI Thread – This megathread is your first port of call if you have any questions about AI’ing bots. The experts of the technique should be on hand here to help you if you have any trouble. The other possibility is getting another, more experienced user to AI the robots for you. This, however, must be agreed before you start any threads. 5) Image Manipulation – You will need to create a splash (A compilation image of all competing robots) and brackets (A tree diagram showing the matchups and progressions of the competitors). These don’t have to be fancy but all relevant matchups and images must be obvious. Again, you may ask for another user to provide these for you if you wish. For examples, see any S/B/V thread in Splashes, Brackets and Videos. A useful resource for creating brackets is Challonge, where you can create your bracket in moments, with no need to keep updating images. To practice these skills, you should consider hosting a ‘Personal Tournament’, which can display your capabilities and, if you are a newer user, put yourself in the spotlight to members who may be less aware of you. If you have any questions about any of these things, you can ask in many places around the forum, and the tournament mods, as ever, are available by PM or this thread. State who is AI’ing the robots. State that nobody can be entered until a bot is received and accepted. Show your entry if you are entering, if you're entering one. State the number of entries that you are accepting, and announce wildcards if there will be any. Set a deadline which entries have to be accepted by – this can be extended but not shortened. Finally, state how the empty places will be filled if you don’t get a full plethora of entries. This can be a system of byes, or by using a byebot – show the byebot if the latter is chosen. Remember it's important to keep your entry numbers realistic if it's your first tournament as it can become overwhelming. You can create your own weightclass if you want, also. Generally (Unless your specific tournament doesn’t allow it), you should accept bots that fall into a weight category lighter that the one you specify, but never the other way around. Be sure to check if these bots are intended to be clusterbots or not, however. State Allowed/Forbidden Components – This largely will be you forbidding custom components, but you can allow them also, and if playing stock, you must clarify the suitability of the AI Parts (The 140cm square extender falls under this too). Most stock tournaments allow them but clarification is always helpful. Custom smartzones should also be clarified. State if the Realistic Rule is used, and if so, whether it is Standard or IRL. State the eligibility of BFE, OBJRA2, AAM, Thyrus Glitch, ZeroG, Text Editing or any other out-of-game modification. State the eligibility of in-game glitches, such as Stacking, eFFe Glitching, Axle Loading, Snapper Loading etc. Also clarify the use of Hax Mode, and add stacking restrictions. State which types of robots are allowed and which, if any, are forbidden. State whether clusterbots are allowed, their weight restrictions, and elimination rules. State the format of the tournament – (Deathmatch, Teams, Rumble, Annihilator or other), (Single or Double Elimination), (Best of 3, Single Battles, or other). A double-elimination tournament is a type of elimination tournament competition in which a participant ceases to be eligible to win the tournament's championship upon having lost two games or matches. It stands in contrast to a single-elimination tournament, in which only one defeat results in elimination. A double-elimination tournament is broken into two sets of brackets, the Winners Bracket and Losers Bracket (W and L Brackets for short; also sometimes Upper Bracket and Lower Bracket, respectively). After the first round, the winners proceed into the W Bracket and the losers proceed into the L Bracket. The W Bracket is conducted in the same manner as a single-elimination tournament, except of course that the losers of each round "drop down" into the L Bracket. The championship finals of a double elimination tournament is usually set up to be a possible two games. The rationale is that since the tournament is indeed double elimination, it is unfair to have the Winners' Bracket champion eliminated with its first loss. Therefore, while the Winners' Bracket champion needs to beat the Losers' Bracket champion only once to win the tournament, the Losers' Bracket champion must beat the Winners' Bracket champion twice. This is the standard form of double elimination tournament which is used in most robotic competitions I've competed in as well as the vast majority of double elimination tournaments. It has been several years, but I recall an event that switched to single elimination for the finals match, however this was explicitly stated as a change to the standard format in the event rules. In future double elimination tournaments, it should be assumed that the event is using standard double elimination rules unless explicitly stated otherwise. State the arena(s) to be used and whether hazards will be on or off. State rules regarding Havok Explosions – what you class as one and restart/elimination rules. State how long matches will be – this is almost always the standard 3 mins. State if bots can be upgraded once submitted, what changes people are allowed to make, how many times changes can be made and a deadline for upgrades. State the rules, unique to your tournament, that do not fall under the parameters set above. Set any awards that you will give after the tournament, and any prizes that competitors get from the tournament or upon receiving an award. Once these are all addressed, feel free to move into the poll. If you have any queries about the meaning of any of the terms above, please feel free to ask in this thread or to PM the tournament mods. Once your tournament has at least half it's entry list size in 'Yes' votes (for example, 8 'Yes' votes for a 16 bot tournament), you can move to signups (The poll is unnecessary for Major League hosts) This is done by sending a personal message to either Geice or Thrackerzod saying your tournament is ready to move to signups. One of the mods will move your thread into the signups sub-forum, where the thread now accepts entries. You should accept entries on a first-come-first-serve basis, provided that the submitted bot is legal, according to your rules. This means a person, unless given for a reason (such as a prize), cannot be given a 'reserved spot' while they make their bots. While the signups period is, you should be in the process of AI’ing your entries, creating the splash and creating the brackets. As mentioned above, you will have set a deadline. You cannot cut that deadline short (unless of course your tournament fills up), but you can extend this deadline if you haven’t got all your entries. Do bear in mind that from the day your signups topic is created, you have 4+ months to complete the tournament (i.e. have all videos uploaded), so you cannot keep signups open for too long any may have to use byes or byebots. Once all of the entries are in and accepted, this stage of hosting is complete. When you are ready, you can create a new thread in Brackets & Vids. You should look to start the thread with the splash and possibly the brackets as well, and then upload the videos in chunks or individually. Links to Splash, Brackets and all Videos should all be found in the first post. The 4 month deadline goes up until the end of posting videos, so, while not compressing the uploads into too short a space, ensure that you keep within this deadline. Once the main competition is finished you may upload any other extra videos that you like, before progressing to the awards. Again, this is not a be all and end all list. If you have other prizes, these are acceptable as long as they don’t contravene the below rule (↓). This section will just run through the whole process in a concise way so everything is listed in one place. 1) Have your idea – Discuss in General Tournament Chat if you need to. 2) Create your thread – gauge interest and tweak rules with others’ input. 3) Confirm your rules and put up your poll. 4) PM Geice or Thrackerzod (or both) to have your thread moved to signups once you have sufficient votes. 5) Once it has been moved, begin accepting entries. 6) Begin AI’ing, creating the splash and creating the brackets. 7) When you are ready and all entrants are in, create S/B/V thread. The initial thread will be moved to ‘Completed Tournaments’ at this point. 8) Upload Splash and Brackets. 9) Steadily upload the videos. 10) Conclude tournament and create awards thread. 11) Conclude award voting and hand out prizes. How can I get my tournament noticed? Be original. Tournaments with more interesting premises are more likely to catch the attention of potential entrants. If your tournament is bland, say, Stock Middleweight it’ll take more work on your part to get it voted in. Another thing to consider doing is a Display Tournament. They can keep your profile high, and if you demonstrate here that you are capable of hosting something, then you will become more known to the members of the forum and your tournament may receive more notice. What happens if I do not complete the Tournament within the allotted time? Before you start a tournament you have to make sure that you have the time. It isn’t anybody else’s problem if you fail to ensure this. This, or bailing from hosting your tournament will also mean that you incur a ban from starting a new tournament and if you flout that rule you won’t get the chance to host at all. A summary of this procedure is available in Tournament Management. Of course, the mod team recognises that there are times when something beyond your control crops up and you become unable to complete the tournament. But expect to be questioned on it, because it is important that the ‘lazy bailers’, if you will, do not escape unpunished. If I am unable to complete my tournament, what happens to it? Largely this depends on who is around at the time. If you are lucky, then someone may offer to finish the tournament for you. However, it's not guaranteed that this will happen so don’t hold any preconceptions that someone will finish your tournament. You will need to supply entrants and AI bindings to the new host if your tournament is taken over. There is also the option of postponing it, and finishing it yourself at a later date. Ask in this thread, or ask Trovaner directly in a PM. The community and staff are happy to take any questions you may have. Aside from the information it purveys, the other purpose of this thread is to allow anyone with a question to have an opportunity to ask them. The moderators will check the thread regularly and answer the questions. These questions will also be moved to the FAQ’s section after they have been answered. What this thread is not is some kind of general chat thread. The tournament section has a discussion thread here, but the purpose of this thread is to provide information for tournament hosts. Any off-topic posting will be simply deleted.